Eggplant, a vegetable from Asia and now identified most often with Mediterranean recipes, such as Eggplant Parmigiana, Ratatouille, Moussaka or eating fried eggplant dipped in a batter or egg and flour and fried in a skillet. The eggplants are readily available in the farmer’s markets at this time, late August and September. The deep purple globes are hard to resist, and are in all sizes. The larger the eggplant the more seeds and tendency to more bitterness. Small eggplants have smaller and fewer seeds. LBuy firm deep purple eggplants, store in the refrigerator until ready to use within a day to two. Cut it with stainless steel knife to help prevent the slices turning black. It does not have to be peeled. Eggplant has a lot of moisture therefore sprinkle with salt to draw out the moisture. Also sprinkling with lemon juice will prevent the flesh from blackening. Put pieces into a colander, let set for 30 minutes to 1 hour to allow the juice be drawn out. Rinse the eggplant pieces and dry on paper toweling before proceeding with the recipes. 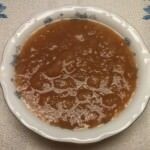 A simple blend of eggplant, cheese and ham for an warm or hot appetizer to a grand meal of roast chicken or meat. Wash and slice eggplants in ½ inch slices. Salt each slice; put into a colander for 30-45 minutes. Drain and rinse, pat dry on paper towels. Mix the oil and seasonings into a large bowl. 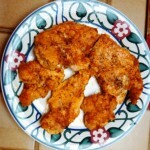 Dip each of the slices in the seasonings and place on jelly roll pan. 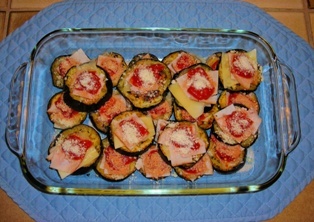 Top each eggplant slice with a slice of Provolone, ham, and a teaspoon of marinara sauce. Broil until slices are browned and cheese has melted. Lower weight, increased energy, healthy hair and skin are benefits from eating eggplant and a variety of fruits and vegetables. 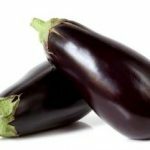 Eggplant studies has indicated a decrease in diabetes, heart disease and obesity. Vitamin C, vitamin B-6 and fiber are important for cardiovascular disease. Antioxidants and anti-inflammatory compounds protect the body from cancer. Because eggplant is low in calories, it provides another source of a low-calorie diet. This entry was posted in Appetizers and tagged appetizers, eggplant, ham, provolone cheese, side dish on September 12, 2016 by Julia Ann.